PUMA's "Create your Style" event where a super quick (really) fashion show featuring the latest Spring/Summer 2010 Collection was unveiled alongside PUMA's newest brand ambassador, Taiwanese music sensation, DA MOUTH. Went to this event long long time ago in February 2010. Where I just have my DSLR recently and haven't get use to the night mode shooting yet. The sound system looks like not good enough or they sing too soft/not singing. Doesn't sounds nice at all =S And they are 1 hour late, although Malaysia time is always late, artist shouldn't be too late also la. Since this event happened nearly half year ago, let see if I remember what happened ya. I was so active in attending events (now also) and able to get Sarita(YengYeng) to tag along. The worker in PUMA, Sunway Pyramid is generous enough to give us 4 passes instead of 2. So we try to invite 2 more friends to come. We have waited for more than an hour before the event able to start. It is always not a good image especially for the artist who come late. Not every place have seats too. We end up standing the whole night. Luckily got friend to hang out with to "burn" the time. In coincident/lucks that I have, me and Serge managed to get Media/VIP passes that enable me to go upstair have some special privilege. It also help me to get some "paparazzi" photos of Da Mouth too. 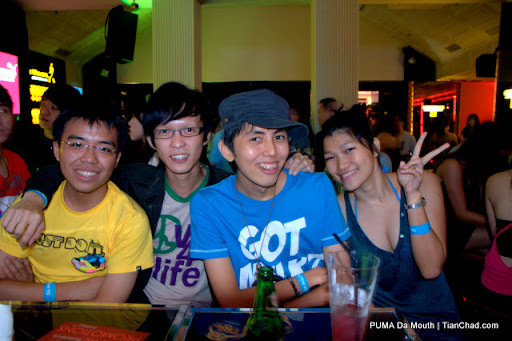 This event is a combination of PUMA Fashion show and Da Mouth's performance. So you will see the mixtures of photo. I always meet Rachel Tan in some of the event. She always mention that I didn't upload the photo and etc. Lol now I have uploaded it only after half a year~! Paiseh la. Peter Davis - Model and talented artist in "SellOut"
"Be a blogger, a brand new media =D"
Thanks PUMA again for the Media pass!